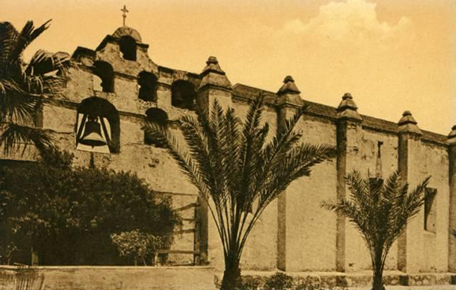 Mission San Gabriel Arcángel, founded in 1771, was fourth in the mission chain. The church was an impressive structure in the Moorish style. A side campanario, or side bell wall, holds six magnificent bells. 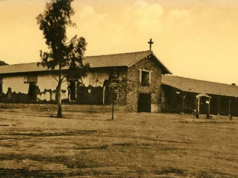 Mission San Gabriel Arcángel was founded September 8th, 1771 by Padres Pedro Cambron and Angel Somera. The mission was fourth in the Mission Chain and was named for the Archangel Gabriel. 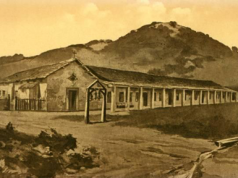 In 1775 the mission was moved to its present site near the town of Montebello to put some distance between the military Presidio and the missionaries. The construction of the church was begun in 1790 and completed in 1805 using cut stone, brick, and mortar. Mission San Gabriel has a strong Moorish architectural influence throughout all of its structures and the original church was impressive in its Moorish style. The side campanario, or side bell wall, is also magnificent holding six beautiful bells. At the height of its existence, Mission San Gabriel Arcángel had no rivals in all of its various enterprises when compared to the other missions of California. In wine making, grain production and the like, Mission San Gabriel always stayed well ahead of the rest. For these reasons, the mission became also known as the “Pride of the Missions” or the “Queen of the Missions” during the early mission era. 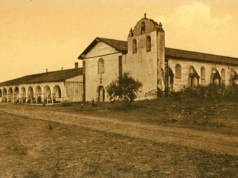 The impressive church of Mission San Gabriel was seriously damaged by an earthquake in 1812. 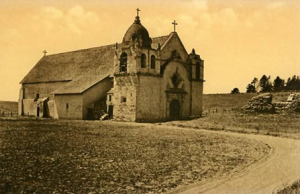 After repairs in 1828, the mission was secularized in 1834 and traded to settle a debt. In 1859 the mission was returned to the church. In 1987, The Whittier earthquake damaged the mission whose structure was fully restored in 1993. The cemetery of San Gabriel Mission is the oldest of the Los Angeles County and it includes a large crucifix memorial honoring more than 5,500 Indians of the Gabrieleno-Tongva tribe, more than 80 Claretian Missionaries and many others. The foundation of Mission San Gabriel Arcángel is celebrated every year on Friday, Saturday and Sunday of Labor Day weekend with religious, historical and cultural events at the mission to commemorate the occurrence. The mission is certainly the most informative of all for travelers in the Los Angeles area.